Is delay in confirming CJ nominee a threat to judicial independence? KATHMANDU, July 31: Serious suspicions of a threat to the independence of the judiciary have surfaced as the Parliamentary Hearings Committee (PHSC) has been repeatedly delaying a decision on whether or not to endorse the nomination of Deepak Raj Joshee as Chief Justice of the Supreme Court. “This is a serious threat to the independence of the judiciary,” Sher Bahadur KC, chairman of Nepal Bar Association, told Republica. According to him, people have begun losing their confidence in the judiciary due to the hearings committee's delays in taking a final decision on the CJ nominee. Despite conducting hearings on Joshee four days ago, the parliamentary panel could not take a decision whether or not to endorse him as CJ. Also, the meeting scheduled for Monday likewise failed to take a decision . At a time when the constitution clearly states that the judiciary shall be an independent institution, the appointment and removal process for judges has created fear among them, and this could ultimately militate against a judiciary that is independent. There was a serious tussle between the government and the judiciary when the Supreme Court was headed by Sushila Karki. 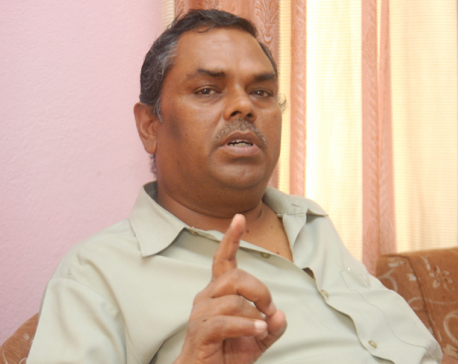 The then government had brought an impeachment motion in parliament against Karki when the apex court quashed various government decisions. 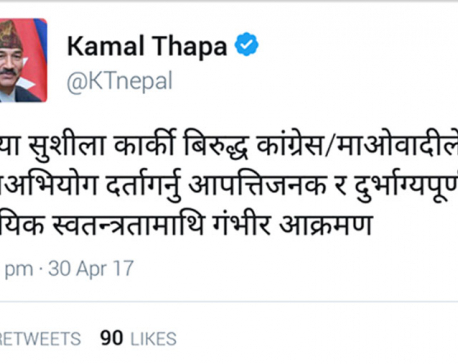 Also, the recent move of the government against former CJ Gopal Parajuli is still fresh in the public mind. He had to exit the apex court unceremoniously in the wake of a controversy over his date of birth given in different documents. “This is a serious threat to the independence of the judiciary,” KC said, adding, “The various issues relating to his academic certificates and his performance were already settled four years ago when he was appointed a justice of the apex court. So the parliamentary panel did not have the right to grill him again and again.” The PHSC members have also raised questions about his academic credentials, his performance as justice and his role in controlling corruption in the judiciary. Joshee's secretariat made public his academic certificates on Monday with a view to clear all doubts on that score. But the parliamentary panel did not take decision whether or not to endorse him for the top position in the judiciary. Along with guarantees of fixed tenure, perks and facilities, which are basic elements in the independence of the judiciary, promotions to expected positions and job security ultimately help ensure the independence of the judiciary. “If such bargaining by the government with the judiciary continues, it would lead the judiciary toward its own destruction,” a former attorney general shared on condition of anonymity. He also cited the recent objection by Prime Minister KP Sharma Oli over the stay orders issued by the Supreme Court in relation to appointments made by the previous government and the blanket ban on protests in Kathmandu Valley. “This is not the end but the beginning of the end,” the former AG added. Even though the hearings committee members claimed that they have been considering the complaints filed against the CJ nominee, people in the legal fraternity have already started worrying about the independence of the judiciary. “We were supposed to take a decision on Monday but could not because we want to take a decision unanimously,” Laxman Lal Karna, senior member of the PHSC conceded. “We are hopeful that we will be able to take a unanimous decision on Wednesday,” he added.